Louisville, KY (December 5, 2014) – Kentucky Farm Bureau President Mark Haney announced today the formation of a task force to develop recommendations for enhancing water resources for agricultural production in the state. The Pulaski County farmer introduced a 20-member “Water Management Working Group” during his keynote address at the organization’s 95th annual meeting. 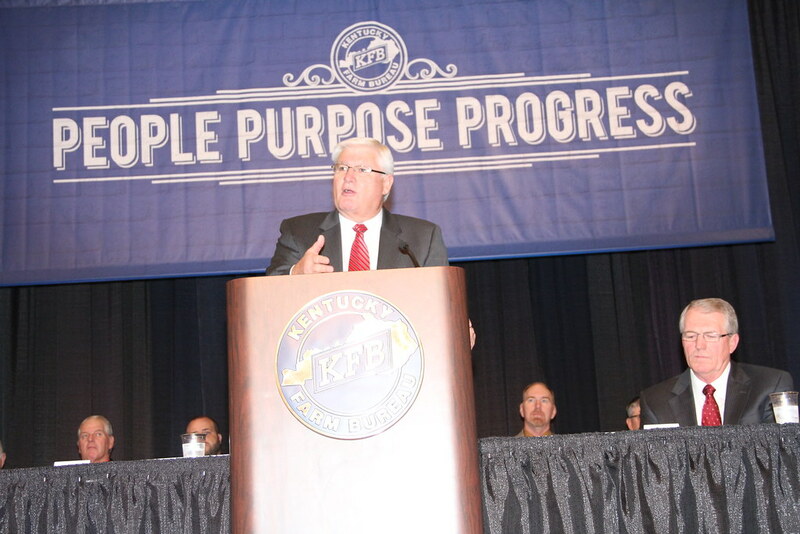 Mark Haney, KFB’s president, gave his address during the organization’s 95th annual meeting, held at the Galt House Hotel in Louisville. Access to an adequate supply of water for agriculture production is emerging as a critical issue for Kentucky farmers, said Haney, noting that agriculture, on average, uses less than one percent of the water from public systems in the state. Ex-officio members are Tom Fern, State Director of the USDA Rural Development office; Michael Griffin, Kentucky Director of the U.S. Geological Survey; John McCauley, State Executive Director of the Farm Service Agency; Kim Richardson, Director of the Kentucky Division of Conservation; and Karen Woodrich, State Conservationist for the Natural Resources Conservation Service. The group will hold its initial meeting on December 10. The mission “is to research the situation, examine potential actions and make recommendations for bringing water to key areas of farm production,” Haney said. A timetable hasn’t been established. “We anticipate this will involve an extended series of meetings, as well as field research,” said Haney.